We don’t get rain very often here in the desert, so to me, a rainy day is the equivalent of one of those perfect snowy days where you don’t need to go anywhere. It’s a put on some music, light a fire, wear a sweater, and bake something kind of day. We had one last week, and I was in heaven. You’re not going to feel like you’re missing anything. And I don’t mean that in a “this broccoli tastes the same as pizza!” kind of way. 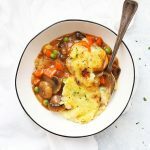 I mean that the veggie-packed filling is hearty, there’s a gorgeous mashed potato layer, and there’s enough “gravy” inside to pull it all together. You Can Totally Use Leftovers. 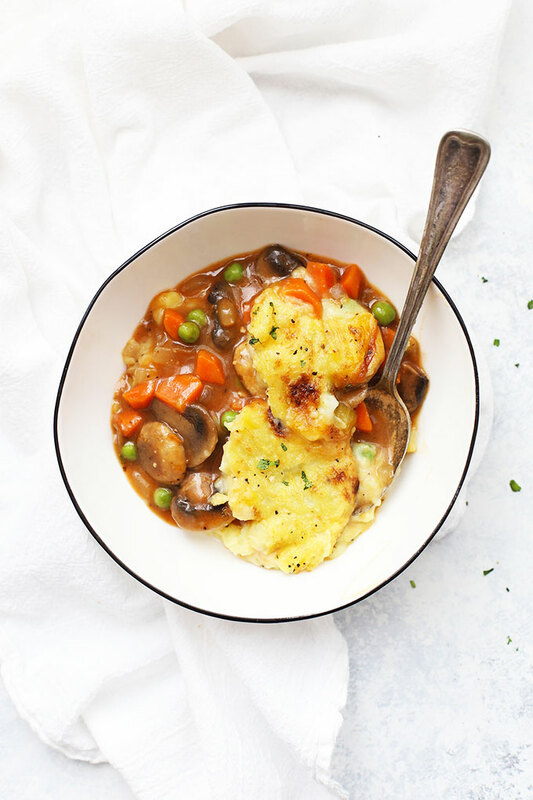 Leftover mashed potatoes are pretty much a fairytale in our house, but if you’ve got leftovers (think: after Sunday dinner or Thanksgiving), you could totally use them for this recipe. 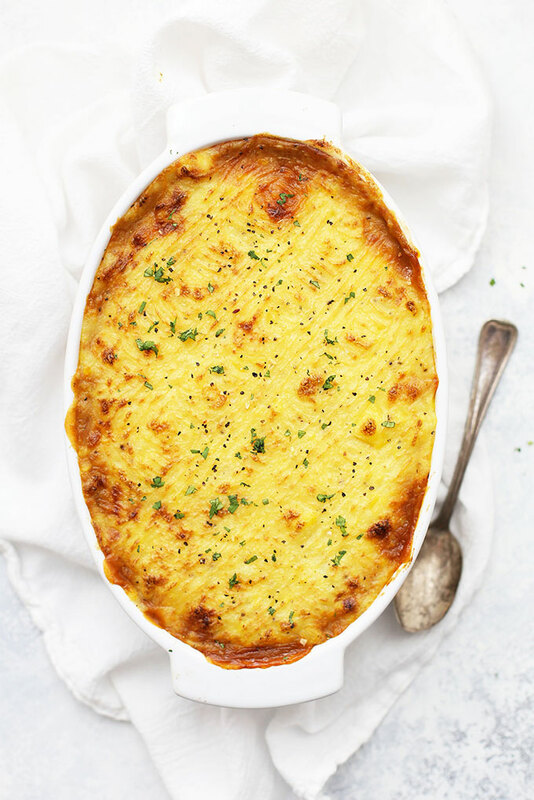 You may want to add a drizzle of milk (whatever kind you drink) to your leftovers potatoes to revive them a bit before topping the shepherd’s pie. Comfort Food At Its Finest. A magical thing happens when you cook mashed potatoes this way. All the creamy, fluffy goodness of the mashed potatoes remains intact underneath, while the top layer gets a delectably crispy treatment that makes for a textural match made in heaven. Between the savory filling, the fluffy/creamy mashed potatoes and the lightly crispy crust on top, it’s close-your-eyes-while-you-eat-it good. Ve-Ve-Veggies! 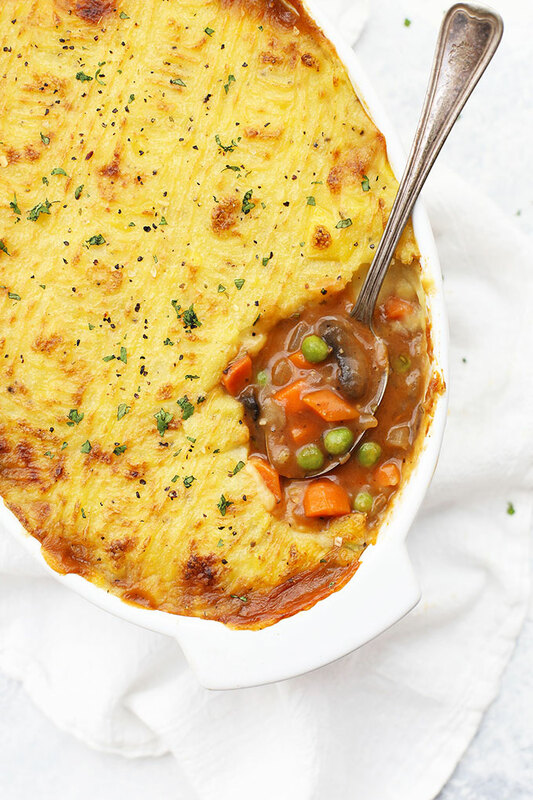 The filling for this gorgeous vegetarian shepherd’s pie is jam-packed with vegetables. You can easily mix and match here–have some bell pepper you’ve been meaning to get to? Why not toss it in? Prefer some green beans in your mix? Go for it! Let’s Talk Pans – You can bake this in any 2-quart capacity dish. That can be an 8×8″ baking dish, a deep round baking dish, an oval baker, etc. Whatever you’ve got! Or, you can divide the filling among ramekins for individual-sized shepherd’s pies. (This can be fun for a Sunday dinner or when you have company.) If you go the ramekin route, just keep an eye on them under the broiler, since they can have a tendency to cook faster. A Note For My Cheese-Loving Friends – In our dairy-eating days, I loved sprinkling the mashed potato layer with some shredded gruyere or sharp white cheddar cheese. (Anything is good–Parmesan, regular cheddar, etc.) It was an extra layer of delicious flavor and tastes delicious. Feel free to sprinkle on a bit of cheese before popping this in the oven! Vegetarian or Vegan Friendly. This recipe is easily vegan or vegetarian. I use unsweetened cashew milk for my mashed potatoes, but any unsweetened milk (dairy or nondairy) will work. As for the butter/oil element in the mashed potatoes, you can use ghee, butter, vegan butter, or light-tasting olive oil depending on your dietary needs and preferences. Change Up the Veggies – You can totally swap in or out any veggies that you like here. I use 1 pound of mushrooms, and then about 4-5 cups of veggies. The recipe can handle up to 6 cups of veggies, so feel free to add in some green beans, corn, bell peppers, parsnips, or leeks if you like. Paleo or Prefer to Skip Potatoes? You can totally use mashed cauliflower if you prefer. Here’s an easy method to use for super creamy mashed cauliflower. Also – if you’re following a paleo diet, you can swap arrowroot for the flour I use in this recipe. It’ll work great (and make this recipe Whole30 compliant!). Season to taste. Add additional milk or butter/oil as desired. Taste and add additional salt and pepper as desired. While the potatoes are cooking, work on your vegetable filling. Heat olive oil over medium heat in a large (11-12″) pan or a Dutch oven. Add carrots, celery, and onion and cook 4-5 minutes to soften. Add mushrooms and continue to cook, stirring until mushrooms are tender, about 5-7 minutes. Add garlic, tomato paste, flour/arrowroot, rosemary, sage, salt, and pepper. Stir to coat the vegetable mixture. Pour in vegetable broth and cook over medium heat until mixture has thickened. Turn off heat. Stir in frozen peas. Transfer vegetable mixture to a 2-quart baking dish. Spread evenly. 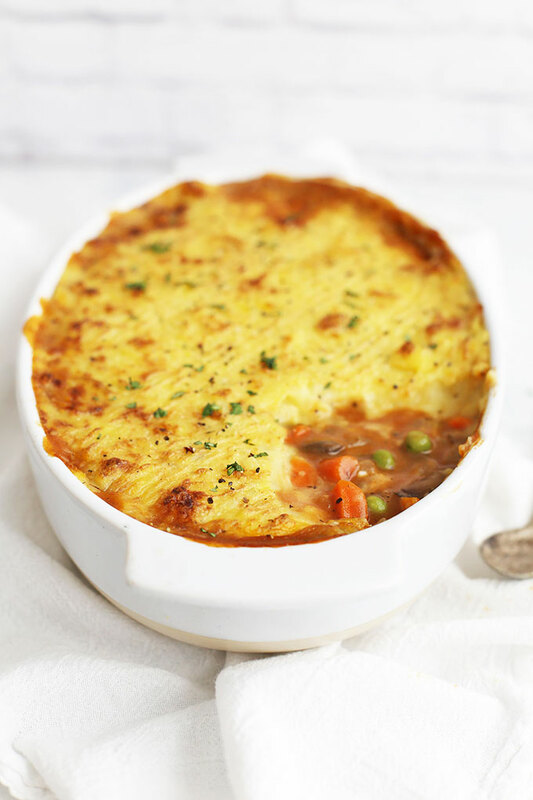 Gently spoon the mashed potatoes on top of the vegetable mixture and smooth over the filling. Rough up the surface of the mashed potatoes with a fork (I make a zig-zag design). This will brown better in the oven. Place baking dish on a sheet pan (in case the filling bubbles over). Bake at 400 degrees 15 minutes, then turn the oven to broil and broil for 3-5 minutes, or until the top of the potatoes are golden. Remove from oven and serve. 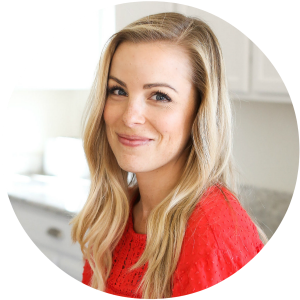 *Paleo Notes: This recipe needs a few simple adjustments to be paleo or Whole30 approved. First, use the arrowroot option for the thickener in the vegetable mixture. Second, if you’re avoiding peas, you can substitute frozen cut green beans. Next, if you use the optional Worcestershire/coconut aminos, you’ll want to be sure you use coconut aminos or approved Worcestershire. Lastly, if you’re avoiding potatoes, you can swap in mashed cauliflower instead. Here’s an easy method to use for super creamy mashed cauliflower. Make it Ahead. This can easily be prepped up until the oven step and refrigerated a day ahead or frozen. To freeze, cover with plastic wrap and foil. Be sure to remove plastic wrap and foil before cooking! If preparing from frozen, I recommend using a metal pan (less temperature shock) and adding an additional 5-10 minutes to your cook time before broiling. Loved this recipe!!!! I used organic coconut milk for the potatoes and skipped any butter or oil. The vegetables and sauce taste delicious!! Thank you! YUM! I’ll have to try that next time! 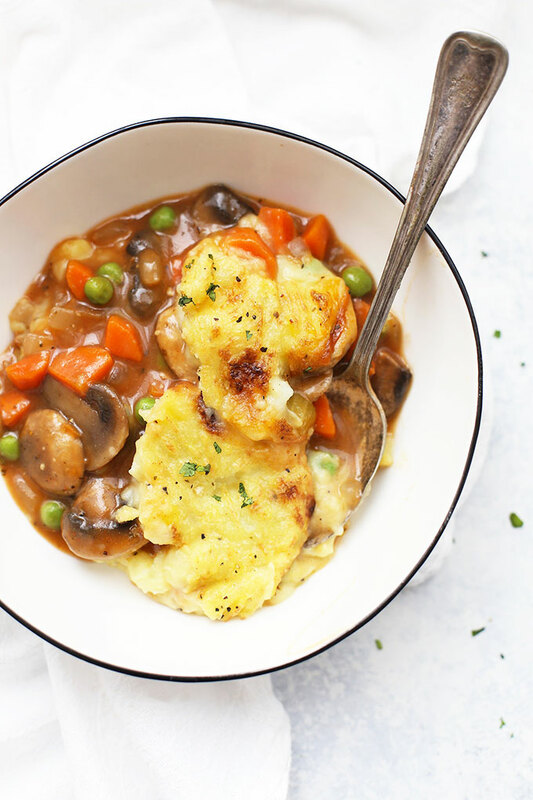 Do you have any feedback for how much of the ingredients you would take out if you decided to use a gluten free gravy mix packet? Thanks! Hannah – I don’t, I’m sorry! I’ve never used one before, so I’m not really sure how that’d change things. Absolutely delicious! I accidentally doubled the Sage and Rosemary and used 2 cups of peas so as to not have any left over. I also got tired of waiting for it to thicken, so I added another teaspoon of flour. I’ll definitely be making this again! Oh yay!!! I’m so glad!! !